I am a sucker for funny play-on-words Valentine’s Day Gifts. Simply saying, “Happy Valentine’s Day” doesn’t cut it for this writer. I created a Hot Tamales Valentine’s Day gift idea made with a mason jar, ribbon, and straw! It is easy, simple, and delicious for the loved ones in your life. Simply buy Hot Tamales at your local grocery store or online if you please. Fill a mason jar with the candy, hot glue a cute ribbon to the lid, and add a few embellishments. Shouldn’t it be Valentine’s Day everyday anyways? I don’t know many people that don’t love a clever and cute way to celebrate the holiday with a tasty twist. Are you a fan of Hot Tamales Valentine gifts? What creative ideas do you have for your valentine this year? This is a cute idea, we love hot tamales around here! Thanks for sharing! 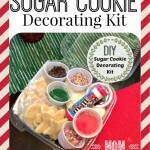 This is such a cute and festive idea! that’s a “sweet” idea; it would make a nice gift.